After more than a year’s work since v3.3, we are very pleased to announce XBMC4Xbox version v3.5. A large number of new features and improvements have been made since v3.3, including the integration of Python 2.7, improved video playback, updates to the skinning engine, scraper fixes, and plenty of bug fixes. Python support in XBMC4Xbox has been overhauled, with the out of date Python 2.4 replaced with Python 2.7. This update, along with the addition of some missing API functions brings much better compatibility with Kodi (Formerly XBMC) plugins. The Addons4Xbox installer has also been updated, allowing many plugins written for Kodi to work right out of the box. The Python 2.7 update also brings performance improvements, and comes with fully working libraries for sqlite3, and SSL amongst others. DVDPlayer (The main video player in XBMC4Xbox) has received numerous changes, including having the FFMpeg core libraries updated to v1.2.8 which brings a variety of new codecs, bug-fixes, and optimisations from the previous 0.10.x version. The libraries used for DVD navigation have also been updated which should bring better compatibility with problematic DVD menus. We had a lot of broken and unmaintained scrapers with the previously version of XBMC4Xbox. With the 3.5 release only a few are included, but they are all maintained and working. We have scrapers for themoviedb.org, thetvdb.com as well as theaudiodb.com for music. Please do support and contribute to these open database projects, as the content and results are only as good as the information people have contributed. 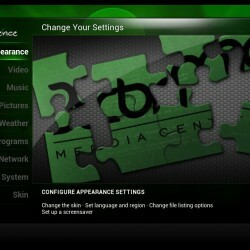 PAPlayer (the core audio player in XBMC4Xbox) has received some updates since the last version of XBMC4Xbox. DVDPlayer’s FFMpeg libraries are now used for decoding of some audio formats which means some of the old out of date libraries we used previously are no longer needed. This simplifies maintenance, and brings with it better performance and compatibility. The FFMpeg libraries are now used for OGG, FLAC, AAC, AC3,and DTS. A variety of improvements have been backported from Kodi for the skin engine. This allows skins and features for Kodi to be more easily implemented. Thanks to the skin developers who requested changes/features and helped with testing. We currently ship with the same selection of skins as with v3.3 – Confluence Lite, Confluence, Project Mayhem III, and the PM3HD skin, but more can be found on the skin development section of our forum (such as the excellent Xbox Extended skin from Dom). Thanks to SwedishGojira we now have our own project branding – our new XBMC4Xbox logo is used on our project site as well as for the XBMC4Xbox boot-up splash. Since the renaming of XBMC to Kodi, there has been some discussion regarding our name. I can confirm we are keeping the name XBMC4Xbox for our project. Changing it now would just introduce more confusion. Thanks to Kodi and their useful tools for handling translations, we are now using the on-line service Transifex to manage translations for the project. This means anyone who wants to help improve translations can now go and sign up over at https://www.transifex.com/organization/xbmc4xbox and start translating the software to their favourite language via the easy to use web interface. The updated translations can then be merged back into the XBMC4Xbox code base by us. There have been many bug fixes around the software with around 44 issues on the bugtracker resolved/fixed as well as more reported via the forum. Thanks to all those that have reported bugs, provided fixes & patches, and helped with testing. As well as the key features above, many other changes have been made with a lot of backported features and fixes from Kodi. Thanks to Team Kodi for creating our favourite media center software 🙂 Thanks also to all those who help and contribute to our project and forum. If you enjoy using XBMC4Xbox and want to show your support for the ongoing development please consider making a donation to the project. Please also do join in the discussions over at our Forum. See the development page for links to the source code and the SVN repository. For binary builds, read the information on the download page. For those that want to build from source, 3.5 is tagged here: https://svn.exotica.org.uk:8443/xbmc4xbox/tags/3.5/. Off-Topic Discussion • Why All The Spam? Theme by NeoEase. Valid XHTML 1.1 and CSS 3. Hosting provided by Mythic-Beasts. See the Hosting Information page for more details.